we guarantee Yard Gard will work for you. or your money back guaranteed if you are not satisfied with the results! 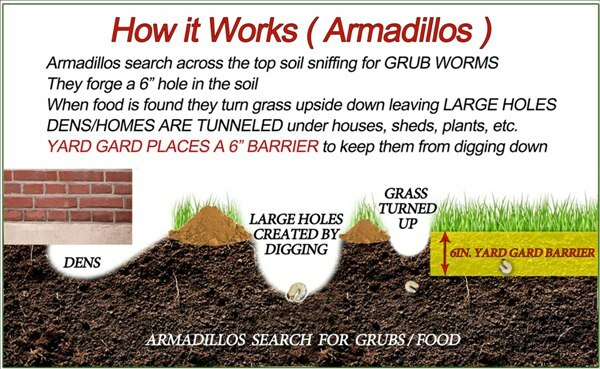 How Does Yard Gard Armadillo Deterrent Work for You? your easy and simple application to your lawn. which assures you of fresh repelling ingredients when Yard Gard is applied to your lawn. Watering your lawn causes the proven and effective ingredients to be slowly released into your lawn as the water-soluble coating shell is dissolved, yielding you the most effective, long lasting results with fresh ingredients each time your lawn is watered. The ingredients are absorbed into your lawn over months, therefore effectively protecting your yard from pests for the longest time period. How is Our Process Advantageous? Yard Gard products are packed with active ingredients - up to 50% more than most other products. Yard Gard's active ingredients are inside the pellet keeping them fresh and from exposure to the elements until they are released into the soil by watering the pellets. Yard Gard is Safe: No harsh man-made chemicals used; it won't harm the environment and it's safe to use around children and household pets. Does the Armadillo Deterrent Work? Yard Gard test results are based on double-blind studies. they only know the product by an ID number. the formulas are then revealed to observe the best formulas. the formulas and ingredients were not revealed until after all studies were completed. Yard Gard formulas & the competitor products were applied in equal manner to the different test lawns. graph samples are displayed here for your consideration. After graph were plotted, the different product formulas and names were then revealed. the amount of water applied to the treated area. the number of animals (armadillos) foraging in the treated area. the amount or thickness of dead grass (thatch) in the treated area. 100 times greater than humans. therefore they have a very keen sense of smell. Yard Gard ingredients are very potent & irritating to the senses of smell & taste of these burrowing animals. they are conditioned or trained to associate the smell of your treated yard with discomfort. This is "Operant Conditioning": Made famous by Pavlov when he conditioned dogs to salivate when they heard the food bell ring. Animals with higher senses of smell are quickly conditioned or trained to leave the treated area.